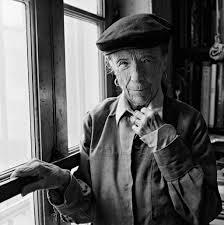 Just 100 years after the birth of Louise Bourgeois in 1911, her work is due to be re-considered and this display at the Haus Der Kunst in Munich affords an opportunity to evaluate a small but interesting section of it. Her concerns flourished in a troubled personal and collective past. Here is revealed a land of mirrors, shadows and memory. The exhibition is dominated by large structures, perhaps up to 6m in height as cells, enclosures and gigantic spider like constructions. Their colours are sparse but significant. These units were created by Bourgeois from 1996 after the year 2000. It is impossible not to be aware from their imposing presence of surrealism, of Kafka and of both feminism and psychoanalysis. 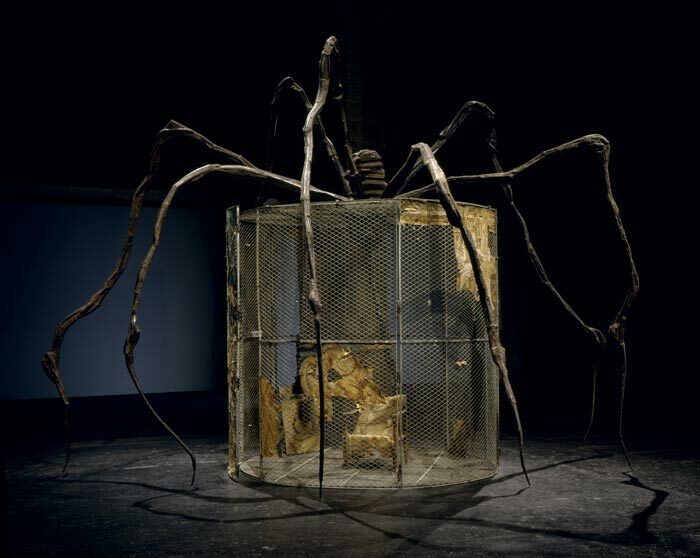 Having undergone analytical treatment, Louise Bourgeois’ work struggles with the emotions of early childhood; jealousy, fear, security, sexuality, voyeurism and mothering are prominent themes in this exhibition. The supporting frames and nesting shapes are reminiscent of her work inspired by Giacometti as well perhaps of Francis Bacon. The cells are enclosures which suggest relationships which may sometimes become claustrophobic. The insides are not entirely open to the viewer who may feel something of an intruder into a private and personal world. 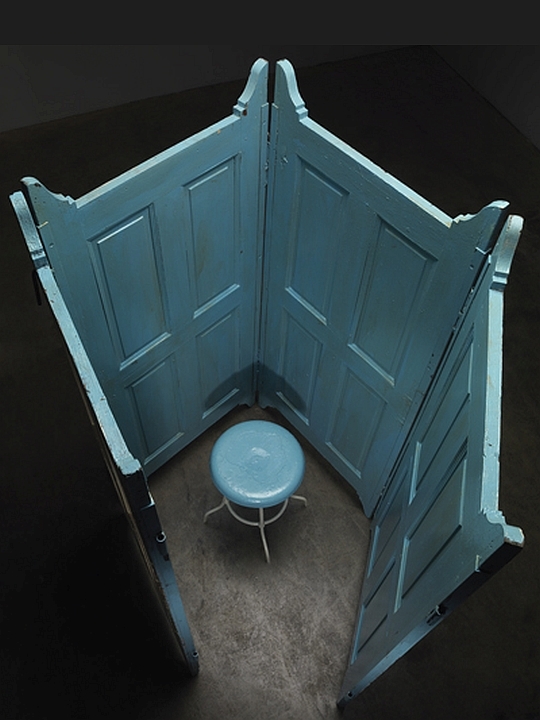 “Cell VI” for instance, consists of a metal stool placed inside a screen of four doors with a gap for the spectator all painted in a light blue suggests an interrogation or perhaps, self-accusation or possibly both. Seeing a number of such structures standing separately, cells or selves in isolation, portraying pre-occupation with past trauma, is reminiscent of Hesse’s evocative poem, “Der Nebel” and its daunting conclusion, “Jeder ist allein”.